When you get sick you need a list of all the possible treatments for your disease. You also need the Treatment Score for each treatment. The Treatment Score represents the "net treatment benefit" for the patient as summarized from the existing medical literature. Why haven't Treatment Scores been done before? Because a typical diagnosis has 10,000 variables that must be digested to create a list of Treatment Scores. My physician colleagues and I have spent years creating the mathematics and programming to do Treatment Scores. Why is something so simple so hard? When you do your taxes you figure out your gross income, then you figure out your net income. Net income = gross income - expenses. When you get sick you need to know the "gross treatment benefit," and then the "net treatment benefit." Net treatment benefit = gross treatment benefit - side effects. It all sounds simple, but patients have never had this kind of treatment transparency. Patients desperately need to know the "net treatment benefit" for patients like them who have been previously treated. Once you know the net treatment benefit, the Treatment Score, as your starting point, shared decision-making and personalized medicine can actually happen. Treatment Scores solve a lot of problems in healthcare! You and your physician can now do shared decision-making, where input from the patient is used to further refine the Treatment Score to do personalized medicine. reporters who report on medical news, whether web-based, television, or radio. Treatment Scores will disrupt healthcare. They are needed by consumers, businesses, and governments. Throughout history, quantification has disrupted every industry it has touched. If they are doing it in the olympics, should we? After seeing so many athletes with cupping therapy during the Olympic games, I became curious if this was actually a good therapy for muscular tension. Of course, I wanted to know the actual Treatment Score and efficacy of cupping on muscular disorders. I went to PubMed and initially researched cupping therapy, figuring that was too general for what I actually wanted to know. I was anticipating that I would have to narrow down my search to at least one body part, or one injury type. I was surprised: I found few clinical observations on cupping, and no actual randomized controlled trials. I elected to review the article on cupping in relation to lumbar myofascial pain, as that seemed to be the closest study to what I was interested in. I went to the Treatment Scores website and put in the information that I had. Unfortunately, the entire article was not available for me to view, so I had limited information to work with. Below are the initial findings I put in the Star™Blocks. The study type only got a quality score of "60", since it was a prospective, controlled study. The overall quality of the study was given a "B" grade. However, the actual treatment score for acupuncture with heated lamps, versus acupuncture with cupping, was different. This can be seen in the comparison of the two treatments below. It does appear that acupuncture can mildly improve symptoms of lumbar back pain. However, as per above, cupping in addition to acupuncture, actually significantly helps improve back pain more than just acupuncture alone. Those Olympic athletes may actually be on to something! [Clinical observation on therapeutic effect of cupping combined with acupuncture stimulation at trigger points for lumbar myofascial pain syndrome]. Ever had a headache and medication did not work? Ever had a migraine headache and thought, "if there was just a quick treatment for this, I'd be good and able to function the rest of the day"? For the first time in my life, I had a migraine headache. It was awful: head pain, unrelentless nausea, and a full work day scheduled. I had no idea what to do. I thought, "gee, I wish I had medicine for this, though any medications I'm familiar with have side effects I cannot function with". So after my headache subsided (days later), I decided to research acute migraine treatments. I narrowed my search down to ER visits, as that seemed like the best way to actually manage an acute migraine if a person does not already have regular medical care for migraine headaches. I found a great study comparing natural IV magnesium sulfate to commonly used migraine medications of IV dexamthasone and metoclopramide. What this studied showed was actually very interesting. First of all, I found that both treatments worked very well. These two pictures further illustrate how magnesium has a Treatment Grade of an "A", while the combination therapy has a Treatment Grade of "B". Magnesium only had a side effect rate of 4% nausea, while the combination medication had a side effect rate of 7% and included other side effects such as vomiting, lethargy and vertigo. It is extremely important that we have access to all of this data readily. Had I known that I could access a single website to find out such information, I would have been able to better understand my treatment options and find adequate treatment sooner. This is not to say that all ERs would have been amenable to my own treatment suggestions, but at least Treatment Scores would have been readily disposable to them as well. Where Do You Go For Sound Medical Information? Do you search the internet in earnest to look up medical information? Do you try to find out the best treatment for your condition, only to come across pages and pages of information that you cannot make sense of? Or pages of useless or conflicting documents? Well me too! And I’m a physician! I spend hours and hours trying to research the newest and best treatments for my patients, only to be frustrated with the misinformation out there. It is trying and tiring sorting out good medical information, from bad. This is why you need Treatment Scores! Treatment Scores aims to acquire the vast amount of medical information there is on the web, in journals, in magazines, etc, whether true or false, and put it into a single place. One location for all medical claims (disease, diagnoses, and treatments). How great would that be? Patients and physicians, alike, will be able to understand true versus false medical information. Not only will we be able to do that, we will be able to see what the statistics say for one treatment and compare it to other treatments for similar conditions. Many physicians and patients, alike, are searching for new and emerging treatments for chronic pain. One of the most debilitating areas of chronic pain can be due to knee arthritis. Knee arthritis affects one's ability to maneuver throughout society without pain. Depending on the degree of pain the patient is in, it will affect their ability to maintain function, exercise, and thus affect other areas of health as well. Due to the fact that we do not know the exact cause of arthritis, it makes it difficult to treat. We do know that with osteoarthritis, people have degeneration of their protective layers of cartilage in their joints. Though we do not know how this happens (and just assume that it is predominately due to wear and tear over time), pharmaceutical companies have come up with ways to try to emulate the job of cartilage in the joints. Of of those medications is called hyaluronic acid (HA). It has been used for many years. It works to provide increased joint lubrication, and thus decrease the friction between two bones that may be rubbing together, thereby decreasing pain. HA is one of the most common treatments for osteoarthritis of the knee. However, it's effects only tend to last about 6 months, and multiple injections are required. Platelet-rich plasma (PRP) is made from the patient's own blood. It has healing properties and can be used in a variety of conditions. It actually serves to stimulated the body's natural ability to regenerate tissues. It is the hope of physicians presently using PRP and other regenerative forms of medicine, that they can recreate the body's natural ability to heal and grow, without the use of pharmaceuticals. In the article that I researched, I was able to compare the use of HA, PRP and HA in combination with PRP for knee osteoarthritis. I regularly perform PRP injections in my clinic. PRP injections are not covered by insurance, and I wanted to make sure that the added cost of the injection, to the patient, was the best medical treatment I could offer them. I was actually surprised to find out how effective all 3 treatments are! Even though the HA treatment group ended up with a Treatment Grade of "D", a 37.5% improvement in physical ability a year after treatment is a good number. However, it is pretty notable that both PRP groups still had a significantly better score than the HA group alone. 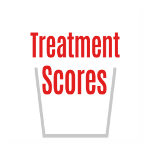 Through Treatment Scores, we can compare different treatments for a variety of diseases in a more organized manner. In this way, we can place values on treatments. Our goal is to make the process of treatment scores transparent so that every step can be verified and validated, and that the "rules" can be assessed as well. We are still in the early stages, and do not claim accuracy for our reviews at this time. (See the disclaimers below). There is controversy in the medical community about the usefulness of spinal fusion surgery for chronic low back pain. If you’re a patient in an area where there are a lot of spine surgeons, you’re much more likely to get surgery than if you live in area where there are fewer surgeons. I’ve heard from surgeons about desperate patients who have tried everything else and they do get better with surgery, but there are several reviews out there questioning the efficacy of spinal fusion for treatment of chronic low back pain. It’s time to take a look at some Treatment Scores. To be clear, we’re talking about patients with chronic low back pain, not patients with acute low back pain, nerve compressions, or spinal stenosis. Our outcome measure will be a decrease in disability, specifically the Oswestry disability index, as this was the outcome used in the studies I found. We are not using pain since this was not the main outcome in the studies. In most cases, if the disability index decreases so does the pain level. I found three randomized controlled trials that compared surgical intervention (specifically spinal fusion) to non-surgical intervention. The best study would be a comparison of surgical intervention vs. sham surgery vs. placebo. As we saw from the studies on vertebroplasties, sham surgeries can have a powerful placebo effect. However, the only studies done were comparing surgical to non-surgical groups. It is difficult to do sham surgeries, although they have been done for some procedures. Nevertheless, the purpose of Treatment Scores is to figure out what we know and what we don’t know about a particular topic so we’ll proceed on. In all of the studies, there was a decrease in the Oswestry disability index (ODI) in the non-surgical group and in the surgical group. The decrease was greater in the surgical group in every case. We’ll use the percent decrease in the ODI in the surgical group minus the percent decrease in the OSI in the non surgical group. The differences in the three studies were 19%, 8%, and 8%. The non-surgical groups were not the same. In one of the studies the patients had physical therapy. In two of the studies the patients had cognitive therapy along with physical therapy. The group that did not have cognitive therapy had the largest difference in the OSI. It should also be noted that these were intention to treat studies meaning that some of the patients assigned to the non-surgical group ended up having surgery and this was a significant number in some of the studies. For example, in one study 28% of the patients assigned to the non-surgical group did have surgery within two years and 4% assigned to the surgical group did not have surgery. Another issue that has to be considered is the MCIC or minimal clinically important change. This is probably around 10 to 15 for the ODI. The differences in these studies are either below or at the border of clinical significance. Also, there was another study which should be mentioned. It was a cohort study following groups of patients who had fusion vs those who did not. Since it is a cohort study, it cannot rank as high as randomized trials, but it was a well done cohort study. They found that patients who did not have surgery were 40% more likely to return to work than patients who did have surgery. A Treatment Score of 6 has a letter grade of E.
To sum up, here is what we know. There is a decrease in disability with spinal fusion for the treatment of chronic low back pain. However, the Treatment Score is low compared to non-surgical groups. It appears to be lower than the MCIC ( minimal clinically important change). The groups who had cognitive therapy along with physical therapy tended to do better. Here’s what we don’t know. There is still uncertainty since spinal fusion has never been compared to sham surgery. Some of the patients who were in the non-surgical group did have surgery. We don’t know if this would have changed the outcome more in favor of spinal fusion if they did not cross over. What Can Treatment Scores Do For You? Treatment Scores aims to provide users (both physicians and patients) with the ability to understand optimal medical treatments, without having to decipher the mass amounts of good and bad medical literature that there is out in the huge world of information and studies. Physicians are under a lot of pressure to keep up with the latest studies in medical information. They are not given many means to do this easily or in a timely fashion. There are so many resources (Internet, societies, magazine, journal articles) that publish different studies on similar information. There is no way a single physician can keep up with all of this medical knowledge. This leads to physicians practicing ancient medicine, and also leads to physician burnout when they try to consolidate the most prevalent information for their patients. From a patient standpoint, they have more access to vast amounts of information on healthcare. One would think that this would enable them to better assess their own health. However, due to the massive amounts of information on the Internet, this actually, more often than not, leads to inaccurate information and assessment of one's own health issues. One purpose of Treatment Scores is to compile all of the medical information in journal articles, papers, the internet, etc, and put it in one place. Additionally, we aim to make this information available to everyone, in a way that is easy to understand. This will serve to lessen the burden on physicians to search the world for new studies. This will also allow patients to access one site, to find out what treatments may serve them best for their single condition. That is not to say that patients will be able to treat themselves, but they may be able to do more accurate research on their diagnosed disease. Patients would thus be able to have an educated conversation with their physicians, about their treatment options. The physicians at Treatment Scores are working to objectively and mathematically compile this information for the public. It will take some time, but it will be done. You should follow Treatment Scores on social media to support our mission of quantifying all medical treatments in order to provide better treatment transparency (for all patients and doctors around the world). I have been questioned by many patients whether hormone replacement therapy is safe or not. This is a very good question, as I don't personally believe we know the true answer to that question. Based on the Women's Health Intiative study that came out in 1996, hormone replacement therapy (HRT) is a bad thing. That study revealed that the combination of Prover and Premarin led to things such as breast cancer, blood clots, and more. After that time, many women were taken off of their HRT. Well, it is no surprise that women did not like to be off of their HRT, as their menopausal symptoms returned. Bioidential hormone replacement therapy (BHRT) then came in to play. BHRT claims to give women chemically identical hormones to the ones that naturally exist in their bodies at younger ages. These hormones are compunded in yams or soy. The HRT study done in the 90s was based on hormones that were not biochemically identical to our naturally occurring hormones, such as horse estrogens (those found in Premarin). Many physicians now prescribe BHRT, while other physicians continue to believe that all HRT is bad, no matter where it comes from. There are not many studies dedicated to BHRT for women. In fact, most physicians who prescribe BHRT claim that there are no studies with adverse effects of BHRT, and they use this as a reason to prescribe BHRT and label it as "safe"
I elected to find at least one decent study on BHRT to properly assess the actual risk versus benefit of BHRT for women. I actually only found one study that was adequate to even consider putting it into Treatment Scores. However, when I began to put this study into the STAR™ blocks, I immediately realized that this study was going to get an "F" grade. This study compared topical BHRT to sublingual. It claimed the "Wilcoxon signed-rank test" as the main statistic to compare menopausal symptom improvement in women. However, the complete article was not available to read, and the abstract did not even mention results of their main statistic. Additionally, the main outcome that they measured is a way to see if 2 means differ, it does not actually evaluate and measure treatment outcomes! In order for a study to even begin to allow us to evaluate and grade it, it must be looking at treatment outcomes. The treatment outcomes in this study are things like hot flashes, night sweats, irritability, anxiety, fatigue, emotional lability, sleep disturbances, memory loss, fatigue, and libido. What they really needed to do is combine all those symptoms into a questionnaire and develop a symptom score for menopausal symptoms that is on a 100 point scale. Again, the scientific research and it's availability to the public needs to be altered. We need clear and concise information as physicians in order to get the best outcomes when treating our patients. Additionally, patients need to have access to the ever changing recommendations of medicine that exists today. When you do your taxes, you figure out your gross income and net income. Before you undergo a medical treatment, you need to figure out the “gross benefit” and the “net benefit” of that treatment. Why is this such a big deal? It’s a big deal, because the medical system has never provided Treatment Scores before. The Treatment Score = the net benefit of the treatment. Treatment Scores have been a secret, a mystery, unable to be calculated, and have been hidden from you until now (because they are mathematically difficult). To repeat, the Treatment Score represents the “net treatment benefit for the patient,” which is a long phrase so we simply call it the Treatment Score. You can see why we simply call it the Treatment Score! When you get sick with a disease, you need to review the medical literature for a list of treatments for that disease. In general, the more treatments that exist for a disease, the less effective the treatments are. For example, there are 130 treatments for insomnia, because most of the treatments for insomnia don’t work very well. There are 57 treatments for an acute migraine headache, because most treatments for an acute migraine headache don’t work very well. There are only a few treatments for stage 1 testicular cancer, because those treatments DO WORK WELL. When you get diagnosed with any disease, for each and every treatment for that disease, you need to figure out the “gross treatment benefit” for patients that have been treated in the past. Then, you need to figure out the “net treatment benefit” for those same patients, which is the Treatment Score. You would think that physicians could help you with the "net treatment benefit." They can't. A randomized survey across 8 countries demonstrated that physicians do not understand treatment effects. In that study of 531 physicians, up to 80% of physicians could not correctly identify treatment effects. You have to be your own healthcare advocate. You need to ask, "What is the Treatment Score?" You need to lead the revolution for treatment transparency by asking, "What is the Treatment Score?" to every healthcare non-profit organization and every healthcare provider that you can. Call a disease-related non-profit today and ask them for the Treatment Score (the net treatment benefit) for a treatment listed on their website. It has always been extremely difficult to produce Treatment Scores. Today, programming makes it possible to create Treatment Scores. Search engine technology makes it possible to find the statistics and database technology makes it possible to organize the statistics. Finally, new statistical methods enable us to calculate Treatment Scores. We have invented the technology you need. Ask for the Treatment Score for every treatment. "What's the Treatment Score for every treatment listed on your website?"